The South Eastern Railway (SER) is one of the 17 railway zones in India and Part of Eastern Railways. It is headquartered at Garden Reach, Kolkata, West Bengal, India. It comprises Adra railway division, Chakradharpur railway division, Kharagpur railway division and Ranchi railway division. 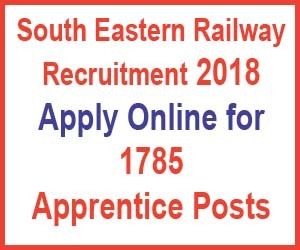 South Eastern Railway invites online application form for Apprentice. Payment Mode (Online): Debit Card/ Credit Card/ Internet Bankng etc.